Another paper showing that the licorice extract Licochalcone A can be used to create well tolerated rosacea treatments. The rosacea community is also saying that the Eucerin Redness Relief products are working well as a part of their rosacea-beating regime. Weber TM, Scholermann A, Burger A, Kolbe L, RJ Ceilley, Trookmann NS, Rizer RL (2005)., Beiersdorf Inc, Norwalk, CT; Beiersdorf AG, Hamburg, Germany; University of Iowa, West Des Moines, IA; Rocky Mountain Laser Center, Colorado Springs, CO; TJ Stephens & Associates, Colorado Springs, CO.
Licochalcone A, derived from the root extract of the licorice plant Glycyrrhiza inflata, has been shown to inhibit pro-inflammatory cytokines, eicosanoids and reactive oxygen species in a number of human skin cells as well as to relieve post-shave irritation and UV-induced erythema in vehicle controlled studies. This poster reports the compatibility and efficacy of a regimen of skin care products containing licochalcone A for individuals with rosacea and persistent facial redness. Redness concealing properties,a reduction of erythema over time, and an improvement of the quality of life are demonstrated benefits in these patients. Objective: This was an 8-week clinical test to demonstrate the anti irritative efficacy and skin compatibility of a product regimen (Eucerin Anti-Redness) containing licochalcone A for subjects with mild-to-moderate Type I rosacea, and facial redness not attributed to rosacea. Study Design: Thirty-two subjects with mild-to-moderate erythematotelangiectatic rosacea (1) and 30 subjects with red facial skin not attributed to rosacea were enrolled and completed the study. The subjects were female, aged 20 and 65 years ,with a mean age of 48. All of the subjects used each of the 4 test products daily. The regimen consisted of a cleanser, an SPF 15 moisturizing day care containing green concealing pigments, a cream concealer (with green pigments) and a night moisturizing cream. Results: Subjects were photographed at the baseline visit, and at weeks 4 and 8. The lighting and photography conditions were carefully controlled and replicated at each photography session. At the baseline visit, standard light photographs were taken before and within 15 minutes of applying the SPF 15 moisturizer and cream concealer, both containing concealing pigments. Discussion and Conclusion: Licochalcone A is shown to reduce pro-inflammatory mediators in vitro and reduce post-shave and UV-induced skin irritation. In this study,we evaluated the compatibility and suitability of a skin care regimen containing licochalcone A for patients with persistent facial redness. After daily use for 8 weeks, the products were judged to be gentle enough for every day use and very well tolerated by the subjects. Both photographs and subject questionnaire responses showed that the green concealing pigments in the day care and cream concealer were very effective in neutralizing the appearance of redness. At both 4 and 8 weeks, there was a statistically significant difference decrease in clinical grading scores for erythema relative to baseline. Differences in facial redness could also be observed in cross-polarized photographs. Compared to the baseline evaluation,there was a significant difference in the QOLI after 8 weeks on the skin care regimen, indicating that the subjects were less affected by their skin condition. In summary,these results support the daily use of Eucerin Anti-Redness skin care products containing licochalcone A for patients with rosacea and facial redness.They can also be used as complimentary skincare for patients with topical metronidazole or azelaic acid. I would think it would be fine. Perhaps try the rozex first and let it absorb in. Watch out for increased sensitivity though, this would be a sign that perhaps the combination isn’t good for you. Hi can anyone tell me if the food it has something to do with the redness. because I kown when I eat chips my face look more red.it has something to do with the oil or grease or spicy food cafeine or something the I don’t know. Yes food is totally related to rosacea flare ups. Any hot foods or drinks, spicy, too sugery, too salty, citris fruits and lots more. Google “rosacea and food” and check out the biggest offenders. I’m just wondering if the different licorice extracts work topically in a similar fashion to cortisone? I’ve read that taken internally, licorice has similar effects by preventing the breakdown of cortisone. Topically it’s probably a different mechanism of action? But worth looking into, since hydrocortizone has it’s risks. hey my sister works in a chemist and brought home a bag of free eucerin products and the redness cream was in it but it is out of dat since august 2009 . would this make a big difference, would the cream definatly not work ? ? my face is hopeless. It is so red and nothing I use, including foundatio covers the red. I don’ thnk it’s rosacea, I don’t know. do any of you ladies have this problem? I suffer Rosacea since 28 Yrs. Tried everything, really no results untol two things; i stopped consuming milk, cheese, etc.. And using Eucerin Redness Relief. It’s been over a year and rosacea is gone. Great product, although difficult to find. 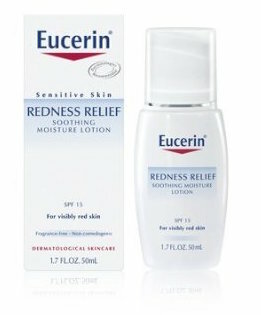 Eucerin redness relief has worked for me for many years but as stated it is getting harder to find. Rite Aid used to carry it but not so sure now. I have had to resort to buying it online at a discount if you buy 3 jars. Does it have a smell? Or masking fragrance? This can cause problems. Can you be more specific on the products used?